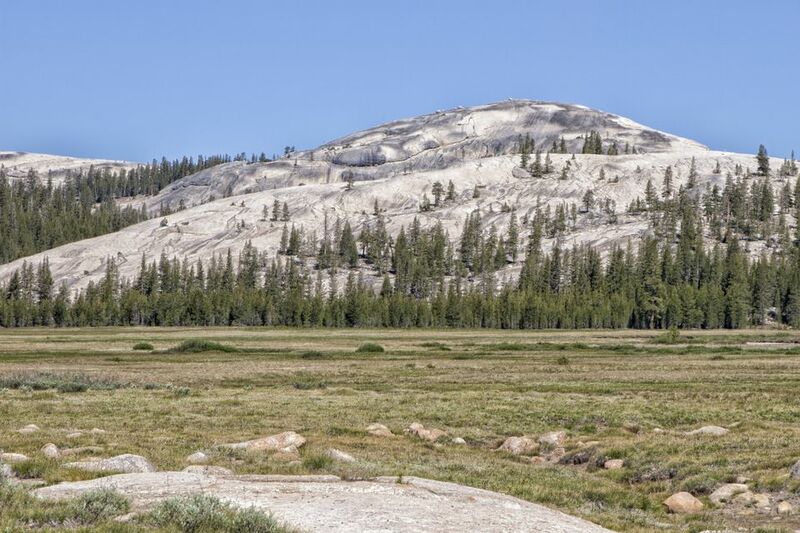 However, while you're in the Yosemite area, Tuolumne Meadows is definitely a trip that's worth taking along a scenic highway to the 8,575-foot-high, sub-alpine meadow. Once you're here, you'll be taken aback by the beauty of granite peaks and domes, so much so that you'll soon be saying, "Yosemite, who?" Take the road less-traveled from Yosemite to the meadows to experience a different side of the national park. Get an idea of what to expect, things to do, how to get there, and where to stay near Tuolumne Meadows with this guide. First, if you're wondering how to say it like I was, is pronounced two-ol-um-knee. Tuolumne Meadows is actually closer to Tioga Pass than it is to the Yosemite Valley. It's Yosemite's epicenter for backcountry hiking, with the John Muir and Pacific Crest Trails passing nearby. Even if you don't want to hike or stay overnight, it's an easy day trip drive to Tuolumne Meadows from the Yosemite Valley. It's an easy addition to make to your itinerary when planning your getaway to Yosemite Valley. When planning your trip, keep the time of year in mind. Tuolumne Meadows is a summer sight — the road closes in winter because of snow. You'll find more information about the road closures here and about Tioga Pass here. Olmstead Point: A few miles west, it's the place to go to enjoy one of the best Yosemite vistas anywhere. Tenaya Lake: A lovely alpine lake right beside the road a few miles before you reach Tuolumne Meadows. Soda Springs: If you're short on time or energy, try the half-mile trail to Soda Springs, named for their naturally carbonated waters. Hiking: Some of the hikes at Tuolumne Meadows are short and relatively easy. Find one that you would like to try with this list. If you want to take in the sights for more than a day, Tuolumne Meadows Lodge offers 69 cabins, each big enough for four and equipped with beds and linens. Be prepared for an old-fashioned experience: there's no electricity at Tuolumne Meadows Lodge, but candles and a wood-burning stove are provided. Visitors share central showers and restrooms. If you want a place that will force you to step away from your inbox and make your kids look up from their phones, these classic cabins may just be the place for you and your family. You will also find a campground at Tuolumne Meadows. If you're susceptible to altitude sickness, you should know that Tuolumne Meadows is one of the highest places in the park, perhaps better-suited for a quick visit than an overnight stay if you're not adjusted to the altitude. If you are leaning toward a day trip from Yosemite, consider these Yosemite lodging options. If you're driving from the Yosemite Valley, take CA Hwy 120 west to Tuolumne Meadows. You can see where it is on this Yosemite map. In summer, you can take a shuttle bus to Tuolumne Meadows from the Valley or use the YARTS Highway 120 bus. Both charge a small fare. A free shuttle bus runs in the Tuolumne Meadows area during the busy season. In winter, the only access to Tuolumne Meadows is by snowshoe or on cross-country skis.